There are external USB hard drives with performance comparable to conventional hard drives. These portable drives (called enclosures) are composed of devices that connect through USB on one side and to conventional hard drives on the other side. A hard drive is installed into the enclosure and then the enclosure is plugged into the computer, thus creating a normal USB backup device. Given the size of nowadays hard drives, this can be considered a mass storage device for backup purposes. Some external hard drives use also FireWire as a connection port. On one side FireWire hard drives tend to have increased speed over USB, but on the other side USB ports are more common on computers. The first step in backing up to USB with Backup4all is starting the device. Usually the enclosure should have a start button and display the status of the drive using led displays. When it is started a green led should be lighted. Go to Start -> Control panel -> Administrative tools -> Computer Management. You should see the additional hard drive disk; right-click on it, choose New partition, then follow the instructions to format the hard drive. 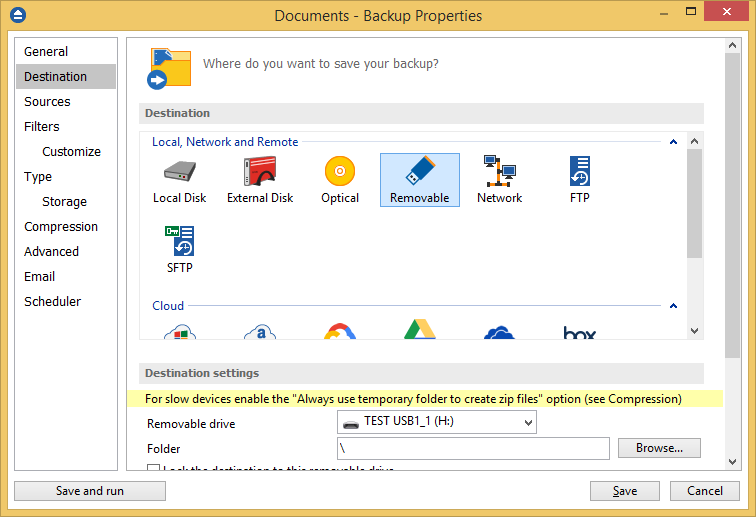 If your USB drive is working correctly, you can set it as a backup destination for an existing backup job in Backup4all, or create a new one. Select the backup job you want to run, press CTRL+P in order to open the Backup Properties window. Go to the Destination and click on the Removable icon. Select a drive from the Removable drive drop down list (your drive should show up in there). Click Save to close the Properties window. Now you can run that backup job to store your backups on the USB drive. Click on File -> New Backup (Ctrl+N). On the first page, enter a name for the backup in the Backup Name field. In the Where do you want to save the backup? section, select the USB drive as backup destination. Press Next. Choose the backup type and encryption in How do you want to backup and press Next. An USB flash drive is a small, lightweight, removable data storage device (also known as "pen drive", "thumb drive", "flash drive", "USB key" or "memory stick"). In comparison with other removable storage solutions (CD/DVD drive or Blu-ray discs), flash drives are not so easily affected by scratches or dust and even impacts, and plus they offer a lot of storage space. This makes them ideal for transporting personal data or work files from one location to another, or for backing up important personal data. Like all flash memory devices, flash drives can sustain only a limited number of write/erase cycles before failure. In normal use, mid-range flash drives currently on the market will support several million cycles, although write operations will gradually slow as the device ages. This should be a consideration when using a flash drive for backup purposes. Backup4all can be used for USB backup to a flash drive. Launch Backup4all and either define a new backup job to use as destination the flash drive, or change the destination for an existing backup job. File compression with encryption protection is recommended to be sure that the files are only accessible by the owner and in the event of losing the flash drive the data will not be compromised. Backing up to an USB flash drive is very convenient, since it offers better portability. The digital audio players (MP3 players) are essentially flash drives with sound output, thus you can backup your multimedia files to an mp3 player using the mirror backup type and be able to listen to them in the same time. So if you have an iPod, you can use Backup4all for ipod backups, meaning backing up the multimedia files that you have on your iPod to your local hard drive (or vice-versa). Backup4all also supports and works fine with USB 3.1/3.2 devices. The advantage to back up to an USB 3.1/3.2 device is the transmission speed which is up to 20 Gbit/s, 40 times faster than USB2.0 (480 Mbit/s). USB 3.1/3.2 significantly reduces the time required for data transmission, reduces power consumption, and is backwards compatible with USB 2.0. How to test a backup?